Jerome Powell, President Donald Trump's pick to lead the Federal Reserve, said policy makers will likely lift interest rates higher at the central bank's meeting next month. 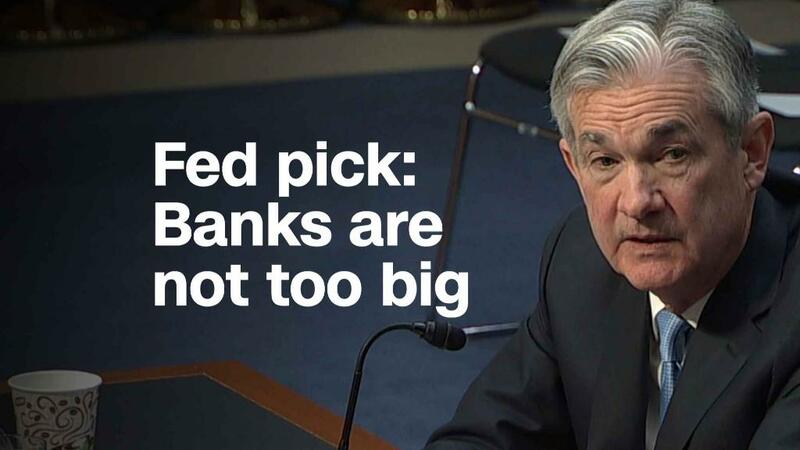 "I think the case for raising rates at our next meeting is coming together," Powell told the Senate Banking Committee during his confirmation hearing Tuesday. He said "conditions are supportive" for another rate hike at the upcoming meeting, which will take place on December 12 and 13. But, he cautioned, no final decision has been made yet. Powell's remarks reinforced market sentiment that the Republican nominee, if confirmed by the Senate, would represent stability and continuity at the U.S. central bank when Fed Chairman Janet Yellen's term expires in February. "The market is grinding higher on the expectation of less regulation, lower taxes, better earnings and a continuation of low interest rates. Investors view Powell as more of the same when it comes to monetary policy," Michael Arone, chief investment strategist at State Street Global Advisors said. A rally in bank stocks helped to push the market to new highs on Tuesday. Shares of JPMorgan Chase (JPM), Bank of America (BAC) and Citigroup (C) each rose more than 2%. Fed officials have been hinting that a rate hike is likely next month. Thus far, the central bank has raised rates three times since last December. Powell also detailed plans to chip away at the Fed's balance sheet. During the financial crisis, the central bank effectively lent trillions of dollars to the government -- mostly Treasury bonds and securities backed by mortgages -- to spur the economy and make it cheaper for everyone to borrow. In September, the central bank said it would begin shedding some of the $4.5 trillion in investments in its portfolio. The announcement reflected confidence by Fed officials that the economy will continue to recover and grow. Powell told the Senate panel he expects the central bank to hold anywhere between $2.5 trillion and $3 trillion of debt in its portfolio over the next three to four years. He said the amount of debt that remained would depend on the public's demand for cash and bank's demand for reserves -- both of which are unknown. Powell also endorsed Chairwoman Janet Yellen's approach in slowly guiding the rise of interest rates and waiting for the right time to begin shedding trillions of dollars in its investments. "We've been patient in removing accommodation and that patience has served us well," Powell told the Senate panel. "It's time for us to begin normalizing interest rates and the balance sheet." 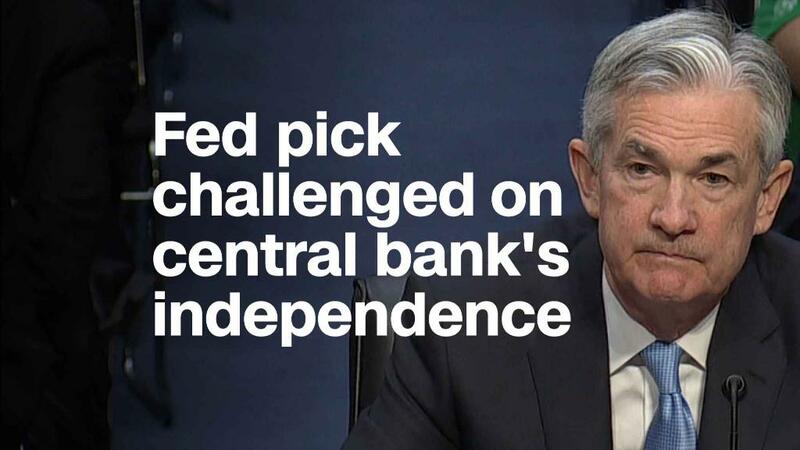 Powell warned that central bankers will try to "make the path of policy as predictable as possible," but will need to "retain the flexibility to adjust our policies" in response to future uncertainties and developments in the economy. Senator Sherrod Brown, the ranking member of the Senate panel, repeatedly pressed Powell on his ability to maintain his independence from political pressure from Trump and Treasury Secretary Steven Mnuchin. Powell vowed to make impartial decisions based on the best available information. "I am committed to making decisions objectively and based on the best available evidence," he said. The Fed governor also left the door open to consider "appropriate ways" to ease rules on banks, while still preserving core pieces of the 2010 Dodd-Frank regulatory overhaul law, including annual stress tests and strong capital requirements. Powell was careful to walk a fine line between defending these regulations and backing proposed legislative changes to relieve the burden on small- and medium-sized financial institutions. When asked by Massachusetts Democratic Sen. Elizabeth Warren if there were rules he would make tougher, Powell replied: "I think they are tough enough." A Fed governor since 2012 and former Treasury official under the George H.W. Bush administration, Powell didn't face too much resistance from lawmakers during Tuesday's hearing. Democrats voted nearly unanimously to confirm Powell twice when he was nominated to the Fed board by President Obama. And not a single Republican has said they plan to oppose his nomination, despite some concerns over his support for Yellen's policies. Democratic senators, however, pressed Powell to share his views of the GOP tax bill now being debated in Congress. But he declined to answer about its possible effect on the economy. Like his predecessors, Fed Chairman Ben Bernanke and Yellen, Powell said the U.S. should address the government's debt. "I think we need to be concerned with fiscal sustainability over the long run," he said.